AmeriCorps is a national service program that engages Americans of all ages and backgrounds in solving community problems. AmeriCorps is an opportunity for someone, like you, to transform your life and the lives of those around you. It's a chance to apply an individual's skills toward helping others and meeting local critical needs. Are you looking for an opportunity to make a real difference in our community? 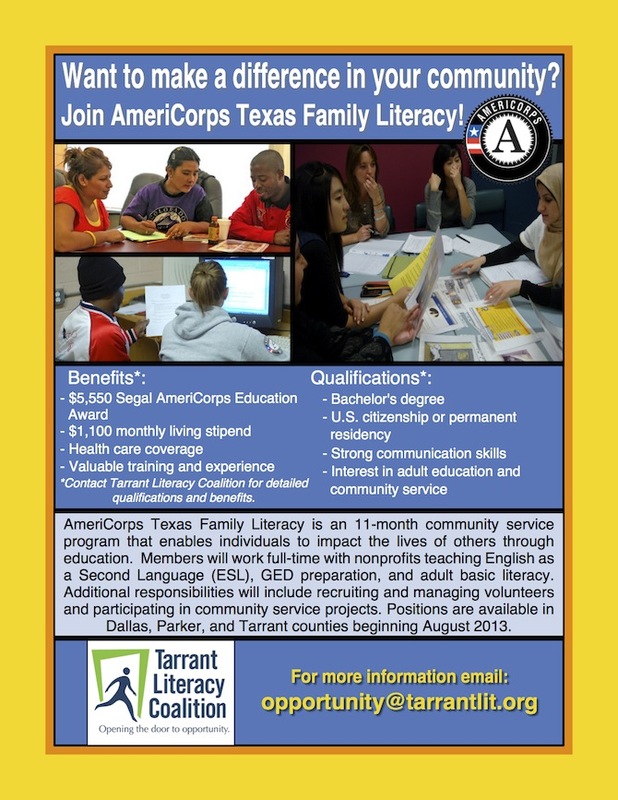 Contact opportunity@tarrantlit.org to learn more about the Texas Family Literacy AmeriCorps Initiative and how you can help share these opportunities with individuals you know. Texas Family Literacy AmeriCorps positions are open to U.S. citizens, nationals, or lawful permanent residents with a Bachelor's degree in any field. All service positions are full-time for eleven months beginning August 1, 2013.